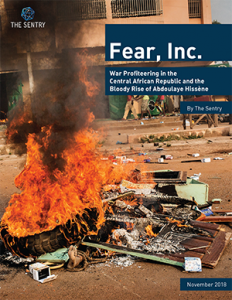 Since 2013, the conflict in the Central African Republic (CAR) has repeatedly made international headlines, with alarms being raised over the escalating violence and even precursors to genocide in the country. Ethnic purges and other mass atrocities continue to take place on a near-daily basis against entire communities. Over the past 20 years, there have been a growing number of initiatives aimed at ending the CAR conflict, but these have had little impact. Today, there are multiple armed gangs, self-defense and politico-military groups that control or exercise influence across the entire national territory. Worse yet, the perpetrators of atrocities are recognized by regional and international actors as legitimate political interlocutors with whom dialogue is necessary and peace must be negotiated. Between 2016 and 2018, The Sentry investigated one such armed group representative, Abdoulaye Hissène, a notorious warlord involved in CAR’s conflict for almost a decade. Formerly a diamond and gold trader, and since 2009 the leader of various politico-military groups, Hissène has been recognized as being responsible for an attempted coup in late 2015 and for targeted violence against UN and humanitarian staff. The Sentry’s investigation also reveals that Hissène has been successful building a profitable business and even since he has been under sanctions. He has amassed a fortune out of devastating sectarian violence. By inciting hatred and sowing divisions between ethnic and religious communities, he has gradually become a central player in the country’s conflict. Hissène’s rise has been possible thanks to strong ties he has developed over time with national and regional heads of state, their close allies, and with foreign business partners. Hissène’s rise illustrates a violent system endemic in CAR, and similar to other countries in east and central Africa, that incentivizes conflict over peace. War profiteers and their allies hamper political and peace efforts, since conflict and state collapse are seen as lucrative business and smart politics. Sectarian violence is used as a political negotiation tool and actors who chose to pursue peace are largely kept out of negotiations. In this system, the greater the perpetrators of atrocities and their accomplices represent a threat to the central power, the more they will become essential political interlocutors and increase their financial gain. Ensure criminal accountability for perpetrators of atrocities, including their commercial actors. Click here to read the report. Cliquez ici pour lire le rapport. Click here to download this one-pager as a PDF.